Sitting on my mantle is a bronze letter M. This M has been in my family as long as I can remember. When I was growing up I didn’t think about where it had come from. I knew it stood for our family name of Mann. Later on I learned the story of the M from my parents. As it turns out, this particular bronze M is a relic from a bygone era of computer history. I grew up in the 1950s just outside of Philadelphia, a block north of the city limits. This was an Irish-Catholic neighborhood. Our neighbors all had 9 or 10 kids. Dads worked and moms stayed home. It was a fun time and place to grow up as there were kids to play with everywhere. Our neighbors to the right of our house were the Williams (we always referred to them as the Williamses). The father worked in construction. He was the one who gave my father the M. The M came from a building that his company was demolishing. For many years that’s all I knew about the M.
When I was older I asked my parents for more details about the origin of the M. The M came from the lettering over the entrance to the Eckert-Mauchly Computer Corporation building, which stood at 3747 Ridge Avenue in Philadelphia in the early 1950s. I have only been able to find one picture of this building. It is low resolution and the lettering is not clear, but certainly the M in my possession looks similar to the M of Mauchly on the building. During and after the Second World War there was a massive stimulus to science and technology. In England Alan Turing and colleagues developed the “Colossus” computer at Bletchley Park that was used to decode German transmissions encrypted with the Enigma machine. There is little doubt that the intelligence gathered through this effort was instrumental in the Allies’ winning the war. Sadly, Turing’s reward was prosecution and persecution for his homosexuality that led to suicide with a cyanide-laced apple — one of the most ignominious events in the history of humanity. In America, at the end of the war, John Mauchly and Prosper Eckert joined forces at the Moore School of Engineering at the University of Pennsylvania to develop the ENIAC computer. Mauchly was what today we would call a “software” guy, and Ecklert was the “hardware” guy. Their computer was as big as a house and contained thousands of vacuum tubes. It worked, though of course its processing power was infinitesimal compared with what we carry around in our pockets nowadays. After doing computing work for the Army at Penn, Mauchly and Eckert decided to form their own company. This decision was due to an issue still familiar today: dispute over intellectual property rights with the university. In 1946 they formed the first commercial computer corporation. Originally called The Electronic Controls Corporation, the name was changed to Eckert-Mauchly Computer Corporation (EMCC) in 1948. The company developed several computers that were sold mostly to government agencies such as the Census Bureau. Of these computers the most famous was UNIVAC. UNIVAC was used to predict (successfully) the presidential election results on TV in 1952. Although we take this use of computers for granted now, at the time this was an amazing feat. Grace Hopper, the computer pioneer who only recently has been getting the recognition she deserves worked at the EMCC. She went on to develop the first computer language compiler. Unfortunately the EMCC lost government funding due to suspicions that they had hired “communist-leaning” engineers (this was the McCarthy era), and the company was taken over in 1950 by the Remington Rand corporation, which at the time made typewriters. Eckert stayed on at Remington Rand (later Sperry, now Unisys), while Mauchly became a consultant. You can see both of them in all their glorious 1950s nerdiness in this YouTube video. At some point in the early 1950s the original building was demolished. I have been unable to determine the exact year. And from that building, as far as I know, only the M sitting on my mantle remains. I don’t mean to trivialize the plight of soldiers with the real thing, but I believe that after many years of carrying a pager (and later a smart phone qua pager) I have developed something akin to PTSD. I seem to have an excessive fright/flight response to the phone ringing, to sudden loud noises, and, bizarrely, to sudden silences. I retired from medicine two years ago. I would have expected my quasi-PTSD to have diminished by now. Maybe it is a teensy bit better, but it’s not gone. After I retired I latched onto social media, thinking it would help fill the void which I expected would inevitably appear when transitioning from the super-busy life of a private practice cardiologist to the laid-back life of a retiree. Facebook, Twitter, Google+ with a bit of Reddit, Tumblr, and Goodreads thrown into the mix. Of the bunch, I have stuck with Twitter most consistently. I like the fact that I can follow people without having to be “friends” with them, or them with me. I like its ephemeral nature. I can dip in and out of the twitter stream, ignoring it for long stretches without the kind of guilt that occurs when I ignore my friends’ posts on Facebook. And the requirement for terseness produces: terseness — something lacking from most social media. I think Twitter’s planned abandonment of the 140 character per tweet limit is a mistake. Like any other rigid art form, whether sonata-allegro form in music, or dactylic hexameter in poetry, the very rigidity of the format forces creativity. Or not. Four letter words, bigotry, hatred, and racism also seem to fit easily into the Twitter form factor. Part and parcel with social media accounts came push notifications. Someone would post something on Facebook. My phone would beep. A notification would appear that someone had posted something on Facebook. 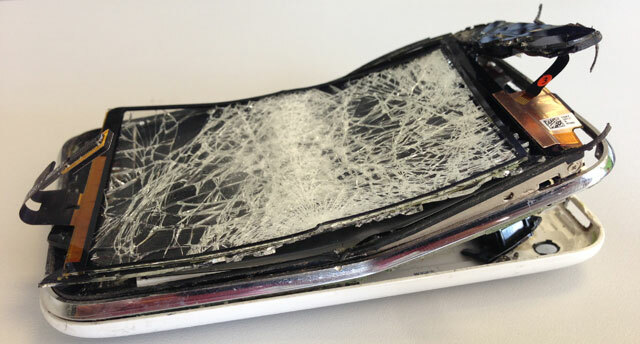 The phone would beep again. There was now an email saying that someone had posted something on Facebook. Multiply this by half a dozen social media accounts and you get a phone that is beeping as much as my old beeper used to beep on a Monday night in July when the moon was full. It was kicking my PTSD back into high gear. It seems that the notification settings for my social media apps were by default intended to insure that, no matter how un-earthshaking a post was, I would be notified come Hell or high water, by telegram if necessary if all else failed. It is a testament to how lazy I am that it actually took me about a year and a half to do something about this situation. Good grief, I was even getting notifications whenever I received an email. Actually, if I ever went a day without receiving an email, that would be something I’d want to be notified about. So finally I turned off all the push notifications I could. Like unsubscribing from email mailing lists, this isn’t as easy as it sounds. The master notification switches are buried deeply in sub-sub-menus within the Settings of each app. But using my sophisticated computer know-how along with a lot of “how do I turn off notifications in such and such app?” Google searches, I was able to accomplish my goal. The cyber-silence is deafening. And it’s a good kind of deafness. I do feel some guilt when I occasionally look at Facebook and see all my friends’ posts that I have not “liked.” I hope they understand that on Facebook not “liking” a post is not the same as not liking a post. Sometimes it’s a bit awkward to tune into Twitter to find that you have been ignoring a direct message that someone sent you three days ago. But overall I find that I can focus better on tasks without the constant nattering interruptions from social media. I still start muttering incoherent potassium replacement orders when the phone rings in the middle of the night, but it is getting better. 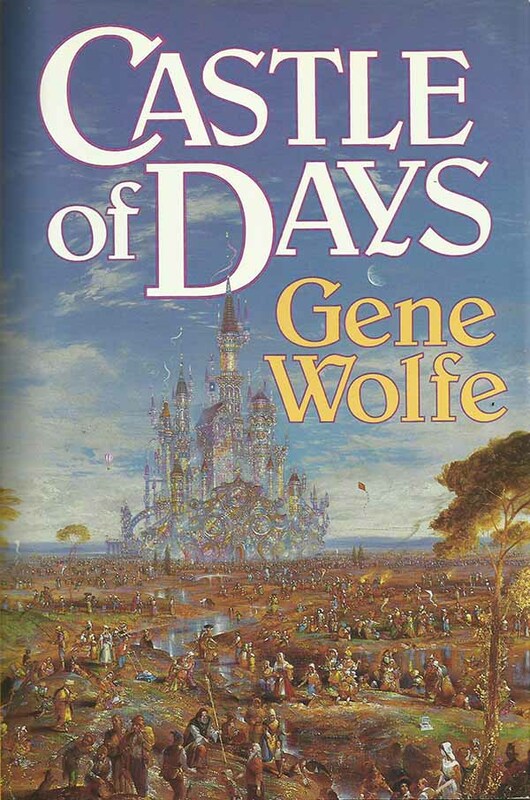 MorbidMeter was inspired by the 1974 short story “Forlesen” by SF writer Gene Wolfe which I read back in 1992 when it was republished in the story collection Castle of Days. Inspired is the right word here. MorbidMeter has nothing to do with the story — a Kafka-esque nightmare that like all of Wolfe’s work is a jewel of writing — except for one element, the undermining of the meaning of time. In the bizarre yet familiar setting of the story, a day is divided into 240 “ours”, an 80 our work shift becomes a whole career, and a whole lifetime occurs in less than a day. This story planted an idea in my head that undoubtedly bubbled along subconsciously for years before finally resurfacing as a computer program. The idea was this: I am X years old, and on average I might live to age Y. If my life span were considered to be a single year, what date would today be? If a single day, what time would it be? And so forth. For example, I was born on November 1, 1951. There are lifespan calculators on the web that estimate longevity; let’s say that I am expected to live to my 86th birthday. Given this, at the time I write this, 10:55 AM MST on November 28, 2015, if I considered this 86 year lifespan as occurring over a single year, it would be 5:36:28 PM on September 29th of that year. Why is this important? It’s not. I already knew I was in the Autumn of my years. And obviously I don’t know how long I will live. No one but terminally ill patients and those on Death Row know this, and even then the timing is never 100% certain. Like many attempts to measure the unmeasurable, MorbidMeter time is too precise. Yet there is something compelling (at least to me) about a weird clock that reflects my whole life span in something easier to grasp than 86 years, like a single year, day, or hour. MorbidMeter time moves slowly, but like all time it does move inexorably forward. Seeing the very slow ticking of MorbidMeter seconds is a reminder that I my life will not last forever, and that I still have things to do. The MorbidMeter time algorithm is pretty simple in theory. You figure out what percentage of your life span you have already lived (age / total lifespan) and then multiply that by the time period you are transposing into (e.g. (percent lifespan) * (1 year)). You then translate the answer into an actual date and time. In practice though, time is messy. There are different calendars. There are leap years and leap seconds. We move around in different time zones. There is also the scourge of our existence, Daylight Savings Time. Computers have not always dealt well with the exigencies of time. Remember the Y2K panic? In order to standardize this mess, computers use the number of seconds since “The Epoch” which is defined as 00:00:00 on January 1, 1970, UTC. This system is not perfect, as it doesn’t account for leap seconds, and has the problem that storing time in a 32 bit integer means that time variables will overflow on January 19, 2038 — the so-called Y2038 problem. Switching to 64 bit integers nicely solves this, adding 293 billion years to the time range in both directions. In any case, the trick is to convert date and time values to seconds or milliseconds since the Epoch, do, the calculations, and convert this value back to a date and time. 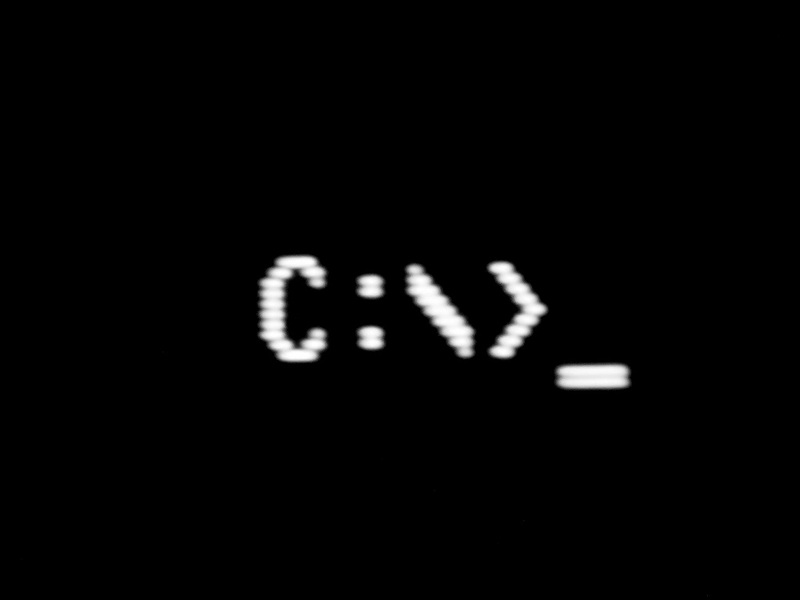 The programming languages have I have used to implement MorbidMeter (which now include Python, Java, and C) all more or less provide these time functions. I started out with a simple command line script in Python, later expanding it to a little GUI window for the desktop. 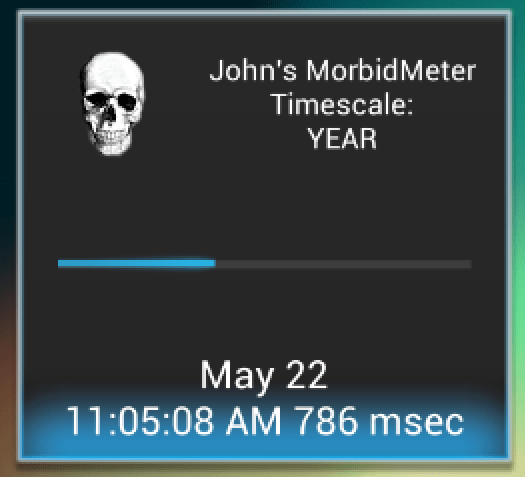 Later I wrote an Android widget to calculate and display MorbidMeter time. It has been the least popular of the apps I have written. Most people don’t seem to “get it.” I discovered from user feedback that most people who actually used the widget were using it as a countdown clock. Someone gave me an actual countdown clock about a year before I retired, and I did enjoy watching it slowly count down the time until January 1, 2014 when I retired. 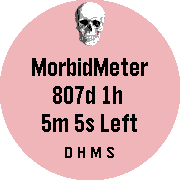 MorbidMeter can certainly be used as a traditional countdown clock, counting down days, hours, minutes and seconds in real time. As such it is not morbid, though you are still stuck with the little skull on the widget. The latest MorbidMeter iteration has been for the Pebble watch. I just completed this and put it on the Pebble watch app store yesterday. It duplicates the functionally of the Android app. The MorbidMeter for Pebble watchface can be used with either Android or Apple smartphones. It can be used as a long or short term timer, and will buzz when the countdown is complete. Shaking the wrist toggles between showing local time and the timer. Some of the timescales of MorbidMeter are a little obscure. For example the Universe timescale stretches time over the entire 15 billion years from the Big Bang until Now. The X-Universe timescales are for my young earth creationist friends who would prefer to believe in a shorter (6000 year) duration of the universe. 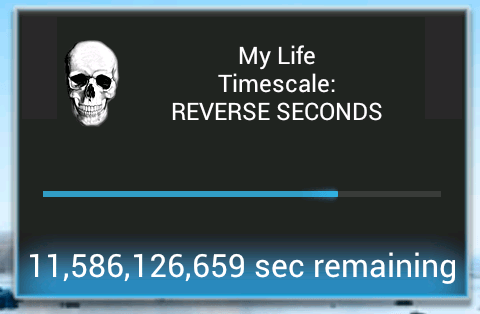 I plan on putting my experience with expanding and shrinking time in MorbidMeter to good use, when I unveil my Time Travel app in the near future. Dr. Lisa Rosenbaum has an excellent piece in the NEJM this week entitled Transitional Chaos or Enduring Harm? The EHR and the Disruption of Medicine. In essence a review of Dr. Robert Wachter’s book The Digital Doctor: Hope, Hype, and Harm at the Dawn of Medicine’s Computer Age, it deals with the ever increasing intrusion of the digital-industrial medical complex on the practice of medicine. Bottom line, electronic health records (EHR) in their present form interfere with patient care. It doesn’t really matter how we got to this point. Many well-meaning people in government, the insurance industry, and the medical software industry have contributed to this mess. Despite good intentions, they have created a broken system. It’s clear why. As Dr. Rosenbaum points out, the one key element lacking input into the development of EHR systems has been physicians. What do they know? Clearly those who designed current EHR systems either don’t know or don’t care how doctors actually practice medicine. There is nothing inherently bad about the concept of electronic health records. There are clear benefits to these systems. The ability to look up medical records online (albeit limited by poor EHR interoperability) is a tremendous advantage over the clumsiness of paper charts. There is no denying that electronic prescribing is a real advance over illegible handwritten prescriptions. EHRs that would be easy, even fun to use can be designed. Doctors are not adverse to technology. Their noses are as buried in their iPhones as much as anyone’s. I don’t even think it would be very hard to design a “fun” EHR. Unfortunately there are powerful forces that would resist such a design. The government and insurance companies want to “play doctor” and tell doctors how to practice medicine through the medium of “meaningful use.” They need to stop using doctors as guinea pigs in this experiment of enforcing medical practice guidelines via EHRs. The system of billing based on documentation is also at fault. EHRs need to shift from documenting for the purpose of billing to documenting for the purpose of medical care. The EHR vendors need to pay attention to the actual workflow of doctors and other health care personnel and emulate that workflow as closely as possible. Like any good tool, EHRs need to be as transparent as possible. The last thing we as doctors should be doing is paying more attention to our computers than our patients. A common physician workflow, which I and many of my colleagues used, is as follows. Whether seeing a patient in the office or in the hospital during rounds, there were 3 basic steps: 1) I would review old notes, test results, and other records. 2) I would go see the patient, take a history and do a physical. During this step the patient has my undivided attention. And 3) write orders and document the visit. The main purpose of the documentation was so I and others could come back later and know what my thoughts and plans were for the patient. This workflow can be emulated using an EHR, but only if the current excessive documentation burden is lessened. In an ideal world, medical documentation would be brief and to the point. We don’t live in that world. Per the medical coders, a written note saying “review of systems negative” can’t compete with a screenfull of checkboxes all checked as negative — as if this is somehow more meaningful. A cut and pasted note chock full of details but identical to the note from the patient’s last office visit is more legitimate than a brief “no changes in patient’s complaints, findings, or plan,” even though they are identical in meaning. Brevity is the soul of wit, but apparently not in the EHR world. Somewhere behind the scenes there are coders counting bullet points and government bureaucrats making sure meaningful use checkboxes are checked. Did you review the patient’s allergies? How could anyone know if the ‘allergies-reviewed’ checkbox isn’t checked? Early versions of Microsoft Word were notorious because of the inclusion of Clippy the paperclip. Clippy would constantly pop up while you were writing with “helpful” hints like “It looks like you are trying to write a letter. Can I help?” The answer was usually a resounding “No, get off my computer,” and mercifully Microsoft euthanized Clippy in later versions of Word. Writers trying to write a novel don’t want some know-it-all computer assistant popping up and offering them suggestions on how to round out characters or improve the plot. They want the computer to get out of their way and just put the words up on the screen that they type. Maybe that’s why George RR Martin still uses ancient no-frills WordStar to write his novels. Similarly doctors don’t want some transmogrified Clippy-monster lurking in their EHR system telling them what to do. “It looks like you are writing a progress note. Would you like to review the patient’s allergies? Please click this button. And if you click just two more review of system points, your note could be coded as a level 4 visit rather than a level 3. Would you like to embed the lab and Xray results in your note? This will show the coders that you have definitely reviewed these results and could bring your note up to a level 5 visit.” And so on. EHRs need to get out of the way of both patients and physicians and become unobtrusive. Government needs to stop trying to social engineer the practice of medicine via meaningful use. The EHR should be a tool like a stethoscope or ultrasound. Right now it is a monster sucking the lifeblood from the profession. Prank calling used to be a common, albeit annoying, form of entertainment back in the days when I grew up, before the invention of caller ID ruined it forever. Some prank calls were just simple and stupid jokes, such as the “do you have Prince Albert in a can?” call. On a slightly more elevated level of maturity, there was the anti-corporate “screw the phone company” philosophy of prank calling. As an example, I remember in college my friends and I decided to call Victoria Land in Antartica. When the British operator asked who would pay for the call, we asked that it be charged to Her Majesty the Queen. We were informed very politely that that would not be possible. So we told her to make the call collect to Admiral Byrd. Amazingly she accepted that as legit. She then said it would take two hours to make the connection. Unfortunately, as I recall, we never got through to the good admiral. Before you get too judgmental about this kind of activity, recall that Steve Wozniak and Steve Jobs got their start together by “phone phreaking,” designing (Steve #1) and selling (Steve #2) so-called “blue boxes” which were used to make long-distance calls without paying. So, as juvenile and even illegal as pranking the phone company might have been, you might not be holding that iPhone in your hand right now if not for it. The most memorable prank call of all occurred the night some of my friends and I decided to call Kurt Gödel and ask him to help us with our homework. Gödel was a mathematical genius, most famous for his “Incompleteness Theorem.” The essence of this theorem is that in any mathematical system at least as complex as simple arithmetic, there are theorems that are true but can’t be proven. The actual mathematics of his proof are complicated. My limited understanding is that he found a way to translate mathematical statements into numbers (called Gödel numbers) and then show that you can use these numbers to represent a statement that states “this statement is not provable.” If this all sounds like gobblygook, there is a whole book that explains this (and a whole lot more) better than I can, Douglas Hofstadter’s classic Gödel-Escher-Bach, An Eternal Golden Braid. In the minds of many mathematicians and philosophers, there is something mystical in Gödel’s proof. Depending on how you look at it, the fact that there are truths that can’t be proven is either disturbing or profound or both. Some have felt the proof has implications as to whether machines can ever develop consciousness, and the self-referential nature of the proof may even have something to do with our own consciousness. My friends and I were learning about all this in a logic class taught at Dartmouth in the early 1970s. One of the texts we used in the class was Nagel and Newman’s book, Gödel’s Proof. While struggling though this text, we collectively got stuck on some point that we didn’t understand. Unfortunately I don’t remember the exact question we had, or whose idea it was to call Dr. Gödel to see if he could answer the question. But for whatever reason (possibly fueled by low doses of intoxicants), it seemed at the time to be an excellent idea. Who better to answer a question about Gödel’s proof than Gödel himself? We knew that Gödel worked at Princeton (where he had been good friends with Einstein), so we called directory assistance for Princeton, New Jersey and obtained his home phone number without difficulty. We then, sitting in a circle on the floor of my dorm room, called him. My friend Bob Lindgren, the boldest of the bunch, made the actual call while we all listened in. Dr. Gödel answered the phone himself, and we all listened to the tinny German-accented voice with amazement. Bob said we were students at Dartmouth College studying his incompleteness theorem, and we had some questions. Professor Gödel very pleasantly said he would be happy to answer any questions, referring to our school as “Dartmoor,” and asked how his friend John Kemeny was doing. Professor Kemeny was president of Dartmouth at the time, was another colleague of Einstein’s, and was an early computer pioneer, coinventing with Tom Kurtz the BASIC computer language. Of course none of us were on speaking terms with Dr. Kemeny, but that didn’t stop us from reassuring Dr. Gödel that his old friend was doing just fine. We promised we would give him Dr. Gödel’s best wishes the next time we saw him. We then proceeded to ask our logic questions to Dr. Gödel, who was gracious enough to waste his evening and precious genius explaining simple mathematical concepts to awestruck college kids. I don’t remember many details of the conversation, though I do remember one thing we asked him that may offer some insight into how he worked. We asked him if the idea for his proof came to him all at once as a Eureka moment, or if it was something that developed more gradually. He replied that it was definitely not a sudden insight. Instead it was something that he worked on over many years. He said he had a broad idea where he was going with his idea from the beginning, but it took his filling in the details over a long period of time before he got the result he wanted. We thanked him for his help and he wished us well. He died a few years later, in 1978. Today in the world of mathematics his work is considered to be comparable in significance to Einstein’s Theory of Relativity in the world of physics. I am not a mathematician and I find Gödel’s incompleteness theorem difficult to grasp — slippery, self-referential and paradoxical, much like thinking about the nature of consciousness. Maybe the two are related after all. On a more practical note, Gödel’s story about how he came up with his proof leads to the profound yet common-sense (the two aren’t necessarily at odds) notion that creating something new and wonderful requires more than just good ideas. It requires hard work, and lots of it. This is important to realize, even for those of us who are not geniuses.